Multi-level LCD display; The meters display the current measurement simultaneously with the current temperature. 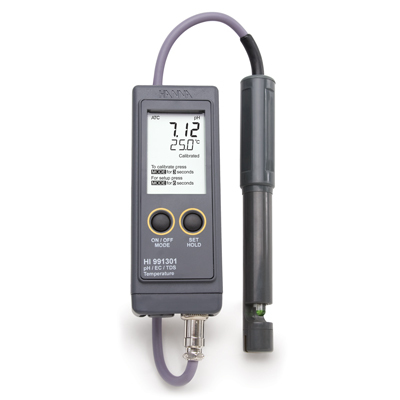 HI 991301 has been designed to offer you pH, conductivity, total dissolved solids and temperature measurements all in a slim, lightweight, portable unit. From purified to brine water measurement, you can select the meter which will work best with your range of conductivity for greater precision. There are only 2 buttons, yet you can select from a range of calibration buffers and even the temperature scale (°C or °F) most familiar to you. The housing is waterproof and rated for IP 67 conditions. The HI 1288 pre-amplified multiparameter probe features an easy to clean sensor and a cloth junction that can be pulled longer to increase the life of the probe. To ensure against interference from transient electrical noise, a solid-state amplifier is integrated into the HI 1288. User selectable features include different TDS factors from 0.45 to 1.00 and a range of temperature coefficients (β) from 0.0 to 2.4% for greater consistency and reproducibility. Standardized buffer recognition values are also selectable. This instrument easily fits in the palm of your hand and the bottom probe connection ensures the electrode cable doesn’t get in your way. The large, multi-level LCD displays the primary reading, temperature and calibration guides simultaneously. HI 991301 is supplied with HI 1288 multiparameter probe, HI 70004 pH 4.01 buffet sachet, HI 70007 pH 7.01 buffer sachet, HI 70030 12880 ?S/cm calibration solution sachet, HI 70038 6.44 g/L (ppt) calibration solution sachet, HI 700661 electrode cleaning solution sachet, batteries, instructions and rugged carrying case.